Getting into an auto accident can be a traumatizing experience. Unfortunately, if you became injured in a car accident in Fayetteville, GA, there are important actions that you need to take. After a car accident occurs, a clock starts ticking on the statute of limitations, and it becomes paramount to contact an auto accident lawyer in Fayetteville, Georgia as quickly as possible. An experienced car accident attorney will work with you after a car accident to ensure you receive the compensation that you deserve. What is the first thing I should do after a car accident in Fayetteville, GA if I get injured? If you are injured in an auto accident in Fayetteville, Georgia, you should call 911 immediately to report the accident. If you are too injured to call, someone else can call for you. This is a crucial action because reports from the police and Emergency Medical Services are essential for filing a car accident injury lawsuit. The EMS report will document your injuries and any medical care you receive. The police report will record information regarding the accident and at-fault driver. This report will also contain witness information, which will be useful if your case goes to court. Should I gather my own information after a car accident? Yes, if possible, you should always gather whatever information you can after an auto accident. Even though the police will gather information, when working with an auto accident attorney in Fayetteville, Georgia, it’s best to have your own records. This can speed up the process and remove the obstacle of waiting for police to respond to requests for information. Collect the driver’s name, contact information, and address if possible. You will also need their insurance information, including the company name, contact information and policy number. You should also write down the names and contact information of any witnesses that stuck around after the accident. You should also take photographs of the scene if possible. Document the damage to your vehicle, any personal property, and of course, any visible injuries that you sustained. If you are too badly injured after the accident, request help from someone at the scene. What if I wasn’t injured enough to call an ambulance? It’s common for injuries to increase over time after a car accident. You might feel alright immediately after, but in the following days and weeks, your symptoms worsen. This is especially common with back and neck strains, and instances of whiplash, which worsen over time. Even if your injuries are not significant, you should seek medical attention immediately. The longer you wait to see a doctor, the harder it becomes to prove that your injuries resulted from the car accident. So, if you have a slight headache, see your doctor because it might be a concussion. If your neck is a bit sore, it could be a serious case of whiplash that will keep you out of work. Everything needs to be documented to obtain the compensation you deserve, so seek medical attention right away even for injuries that seem insignificant. What compensation might I be entitled to? If you get injured in a car accident in Fayetteville, GA, an auto accident attorney can help recover damages. These damages related to direct financial costs, as well as emotional and indirect costs. Compensatory damages are the most common type, and these get broken down into specific and general damages. Specific damages are amounts the directly related to the car accident and resulting injuries. This includes medical bills, lost wages, property loss, and the loss of your earning capability. General damages are subjective amounts and include pain and suffering, loss of an extremity, loss of consortium, emotional distress, and other losses that are difficult to calculate. In the event that the defendant was careless or criminally negligent when causing the accident, you can also seek punitive damages. This amount is imposed by the court and is used to punish the defendant. Damages in an auto accident are difficult to calculate, but a car accident attorney can help you navigate through the process. 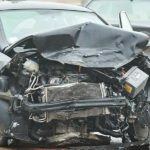 If you got injured in a car accident in Fayetteville, Georgia, contact the experienced auto accident attorneys at the Wade Law Office. If you were injured in a local auto accident on private property or a wreck on the highway, we will discuss your case and determine the best strategy to obtain the compensation that you deserve.